What If You Knew The Setlist in Advance? I saw Heart and Def Leppard last night at the Molson Amphitheatre. The tickets were in the WagJag box, which is right behind the sound and light mixers. They were great seats, but being behind the sound and light mixers meant there was to be no surprises. 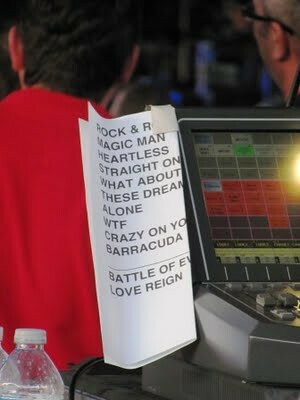 I had a perfect view of both setlists. On the bright side, I could anticipate hearing my favourite tunes and I knew when the encore was truly over, but I found myself missing the element of surprise. It's fun when you hear that note that tells you what they're playing next, and it's fun trying to guess what they'll close with, etc. I think I'd prefer not knowing the setlist in advance. What about you? If you had the option, would you want to know the setlist in advance? The pictures above, by the way, were taken from Teena in Toronto's blog. She was there in the WagJag box last night as well, after winning a little contest. She took way better pics than I did. I prefer a surprise, but oftentimes, when I've found my way to the very front of the crowd, I can easily read the musician's setlists on the ground. 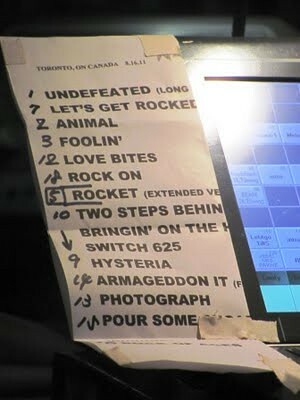 At least I know whether or not I need to call out my favourite song to get them to play off setlist or not! I see your point, but many times at smaller shows I'm standing by the front of the stage and can peek the set list anyway. I don't think it really affects my enjoyment of the show in any considerable way. Heart has a song called WTF? WTF was the only new song they played. In fact, it was the only "new" song outside of Ko's stuff we heard all night. It was weird seeing the list ... as you said, it took the element of surprise out of it. On the other hand, it gave me a head's up that some of my more fav songs were going to be played. I wish I saw Dylan's set list last time I saw him so I knew what song was he was playing. I started listening to CBC 2's drive this month. I like having every song introduced BEFORE and after. (Would prefer two at a time, and less k.d. lang pushing). Unlike those 10 in a row stations. But I wouldn't care to know three or more songs lined up in advance. One of the nice things about seeing Springsteen... He doesn't even follow the setlist he writes up calling mid-set audibles. I would prefer to know the list in advance. I want to know how long the show is going to go on, but that's just me. @LJP timestamps show we basically typed our thoughts at the same time :). Great minds think alike! Really? Every song announced before and after? Doesn't that kind of interrupt the flow of the music? Personally, I'd rather hear Lemmy start pounding out his bass intro to Ace of Spades as the previous song fades rather than having the announcer stop and tell me what I'd just heard and what I'm about to hear. No. I'd rather enjoy the show as it unfolds. No thanks. The element of surprise is preferred. You can go all nuts when you hear the opening riff off one of your fav songs. I love crowd reaction to when they realize which song is being played.